Rachel Hill talks to us about LabPlus, postgraduate study, and what she learnt from her placement year in Plymouth and a field trip to Hong Kong. Since completing my undergraduate degree in Environmental Science I have carried on at Plymouth in order to study a masters in Environmental Consultancy. This has been a well-rounded course which has enabled me to apply my knowledge from my undergraduate degree to practical skills which are valuable in a professional environment. Undertaking an eight week placement during my masters was an amazing opportunity. I spent my placement at MVV Environment Devonport’s Energy from Waste Combined Heat and Power Facility in Plymouth. This opportunity really made me focus on what I want to do after my degree and gave me a great experience in a professional environment. The one thing which I may have done differently is chosen a course which was more specialist. Although I have really enjoyed my masters degree, I wish I had done something which was more specific, giving me a stronger career path and more in-depth information on a certain subject. However, saying this, when I was looking to do postgraduate study I wasn’t sure what I wanted to do, so a more varied course was more appropriate at the time. I would have told myself to really put myself out there and take any opportunity which arose, whether this was joining societies or taking a break from work and going out with friends, making sure I got out of my comfort zone. University is definitely a learning curve and something which helps you to explore the wider world, so you need to make the most of it. I chose to do both my courses at Plymouth because it is a well-respected university with a strong reputation which has certainly helped me when looking for jobs. My undergraduate degree was accredited and offered further educational opportunities, such as the Hong Kong field trip. While studying, I often used the library and LabPlus as they are excellent areas to really take the time to focus on pieces of work. I was part of a PALS group in my first year as well which really helped me through the transition into university life and, following this, I became a PALs leader myself. 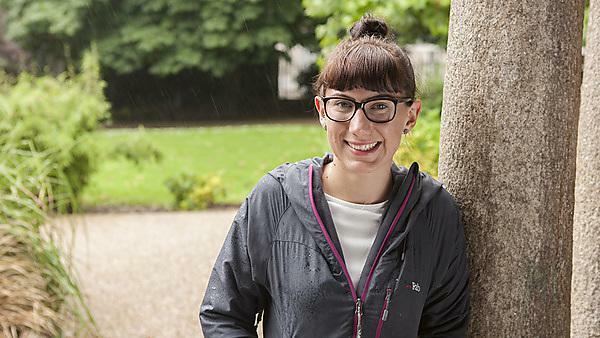 I think studying at Plymouth has broadened my aspirations; it has really helped me to understand the different possibilities I can pursue with my degree. The lecturers were vital in this, with their vast knowledge and backgrounds in environmental roles giving me a wider understanding. One of my favourite memories of studying at Plymouth was the second year field trip to Hong Kong, during my undergraduate degree. Having not travelled much, this was an incredible experience to really immerse myself in another culture. We spent a month out there undertaking a project and, at the end, a few of us stayed on to spend a week exploring the country. Studying at Plymouth has definitely made me more independent and focused on what I want to do. It has given me a wide variety of skills, not only through my course but through other activities such as societies and using the career hub services. Plymouth is a great university; it is situated in the heart of the city giving you a great social life and chance to explore, opportunities in terms of societies and events, and it also provides you with the knowledge and expertise of the lecturers who can help you make the most of your time at Plymouth. Undertaking an eight week placement as part of my masters degree really gave me a taste of working life and steered my future career ideas. The University was really helpful in finding me a specific placement which was tailored to what I wanted to do.